Observation - Grey squirrel - UK and Ireland. Description: Adult grey squirrel,grey fur,orange tinges around face.Large bushy tail,used for balance.Feeds primarily on acorns/hazelnuts. 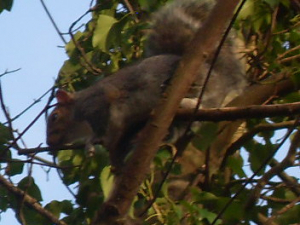 Adult grey squirrel,grey fur,orange tinges around face.Large bushy tail,used for balance.Feeds primarily on acorns/hazelnuts.